Budget-Friendly Ways To Improve Your Cat's Diet | Purrrfectly Holistic...a Boutique for Cats! Purrrfectly Holistic…a Boutique for Cats! The article I read included a Packaged Facts survey from 2016 on food feeding patterns in the past thirty days. 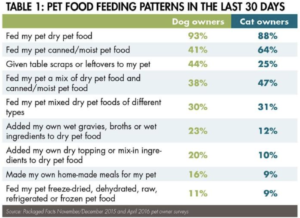 Not surprisingly, 88% of cat parents fed their cat dry food, 64% fed canned/moist food, and 47% fed a mix of both. As a cat health educator my goal is to reduce the 88% feeding dry food and teach people how to make their cat’s diet healthier. Is dry food good for your cat? Kibble is by far the least expensive and most convenient way to feed your cat, which is why it’s so popular. But it’s by far the least nutritious, despite what pet food manufacturers would have you believe. If all YOU ate everyday was processed “food” out of a box or bag how long would it take before you were facing nutrient deficiencies or a serious health condition? Cats are no different. A dry diet puts stress on the kidneys, decreasing life span in most cases. Dry food requires a high percentage of carbohydrate to make it stick together. Cats aren’t designed to eat carbohydrates, so ideally the total amount in the food should be under 8%. Dry food can end up having 30% up to almost 50% in some brands. High amounts of carbohydrates promote inflammation, pancreatitis, diabetes, cancer, obesity, IBD, and other diseases. Manufacturers use loads of chemicals and flavor enhancers to make the food appealing. Dry food is commonly made from a mixture of cheap, unhealthy ingredients that are unfit for human consumption. These can include “4-D”meats: diseased, dying, dead, and disabled animals. Rendering plants don’t discriminate and will accept euthanized pets, animals with tumors and maggots, expired meats from grocery stores as well as road kill. These ingredients are not inspected by the USDA. The cooking or “rendering” process involves heating this slew of nasty ingredients to extremely high temperatures which create chemical by-products called acrylamides and heterocyclic amines, both of which are carcinogenic. The kibble bags are lined with materials that leach cancer-causing chemicals into the product. The end product of dry food is void of living enzymes and nutrients and is nothing like the beautiful pictures of meat, fruits and vegetables on the package. This is why vitamins, minerals, and other micro-nutrients must be added back in. Chemical preservatives, often toxic, are used to promote a long shelf life. When I first learned of these facts I felt horribly guilty for feeding my cats a kibble only diet years ago. If you’re feeling the same way don’t blame yourself. Like you, I didn’t know! Now it’s time to start making better choices! If money is tight but you truly want to do the best for your cat, let’s talk about some simple things you can do. Let’s start with hydration. Add a small amount of water to your cat’s dry food or even wet food. Remember, moisture is key! 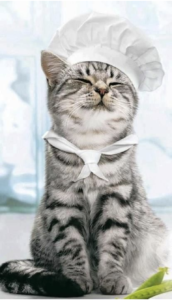 You can also add homemade or packaged bone broths to your cat’s dry (and even wet) food. The meat flavor may be more enticing than plain water. Fruitables now makes Broth Bowls, making this option even easier! Cats who love tuna may enjoy a little tuna juice from the can poured onto their food. Make sure it’s from tuna in water and not oil! Remember when you were a kid and couldn’t get enough of sprinkles on cookies or ice cream? Maybe you still can’t! Toppings can make food more fun and interesting. Be creative! Buy a bag of single ingredient cat treats like Halo, Grandma Lucy’s, or Sojos and crumble a piece of two on top of your cat’s dry or wet food. Brands like Primal and Stella & Chewy’s make great freeze-dried foods that you can crumble as well as rehydrate. Whoever told you that cats shouldn’t eat human food was misinformed. Human grade meat is exactly what cats should be eating! 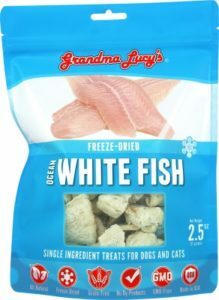 If your cat loves baked or grilled chicken or fish, add a few bites in her food. Explore lightly cooking some ground turkey, chicken or beef and mix it in to her food. Another way of adding great nutrition to dry food is to add an egg. Your cat may prefer you to whisk the egg or lightly cook it first before adding some or all of the mixture to the dry food. Eggs are highly nutritious and are a great source of healthy fat and protein. If you’re interested in trying to add a bit of raw food I have a couple of tips. Buy a 1/4 or 1/2 pound of meat (ground chicken, turkey, beef, lamb, pork, etc.) from the butcher counter. Measure out tablespoon portions and put in snack size plastic bags. Reserve one bag in the refrigerator and put the rest inside a large freezer bag and freeze it. This way you can defrost one baggie at a time. Take a 1/4 teaspoon from the thawed portion of and mix it into the wet food. 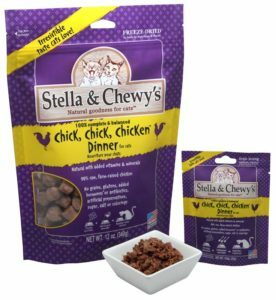 You can also buy a small bag of commercially frozen raw cat food (Primal, Stella & Chewy’s, Nature’s Variety). Thaw a 1 ounce nugget or 1/4 cup of bite-size pieces. Place the raw meat/food in the bowl with the kibble to get your cat to associate it as food. She may not be tempted at first. But over time she will become curious to at least taste it and eat it. Be patient! If your cat is agreeable to the raw, cooked, freeze-dried or canned food bites work up to making the portion around 20% of the total meal. Simply making a 20% improvement to your cat’s overall diet can have a profound effect on her overall health. If you’re not able to do it everyday of the week, make it a goal to do it at least 2-3 days a week. Not all canned foods are made equally! If you buy canned food at the grocery store or vet clinic you need to READ THE LABEL! The FIRST ingredient/s should be real meat: chicken, turkey, beef, etc. If you see words like by-products (ie: chicken by-products), meat meal (ie: chicken meal, fish meal, turkey meal, etc. ), or hydrolyzed, don’t buy it. Canned products with ingredients including corn, pea, wheat, or soy products should also be avoided. These ingredients will not provide great nutrition for your cat even though your goal is to add more hydration to the diet by giving canned food. Many people believe dry food is good for their cat’s teeth because they need to “chew” something hard. As carnivores cat’s mouths are biologically designed to tear and rip flesh and chew bones. The sticky carbohydrates used to make dry food actually promote tartar and plaque build up, resulting in dental disease. Cats in the wild don’t have this problem. The bones and fur from prey actually clean their teeth and gums as they eat! 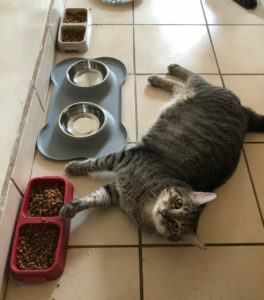 By mixing in small amounts of the higher quality products with your cat’s regular dry or wet food will not only be more budget-friendly it can go a long way in improving your cat’s overall nutrition and health. When you consider how expensive vet bills can be when facing an illness or chronic disease, paying a little bit more in the name of prevention is more than worth it. 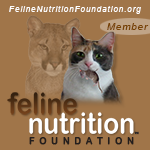 If you want to learn more about reading pet food labels be sure to check out Optimal Nutrition For Cats. Leave a comment below to share things you are doing to improve your cat’s diet on a budget.